When your furnace or heat pump system is on the fritz, don’t sweat – just call Flamewright Services Ltd! With over 10 years in business and over 30 years of combined experience in the company, we are Nanaimo ’s most reliable HVAC Repair company. Our team of licensed and experienced experts will have your furnace back up and running in no time, regardless of whether it’s a single unit in your home or a complex HVAC system. Give us a call, and we will be there when you need us to be. Of course, the best way to keep your heating and cooling system in good repair is regular maintenance. Here at Flame Wright, we recommend that all of our customers schedule regular maintenance appointments with us. We will keep your heat pump or furnace running at peak efficiency, which helps you to save energy and prolongs the life of your system. Regular maintenance that fixes problems before they become serious is much more cost effective than waiting until your system breaks down and paying for repairs. Sometimes it just is not possible to repair an old furnace or fireplace. A unit can just be too old or too damaged, and simply replacing it becomes more cost effective. When this happens, there’s no need to panic. We offer a wide range of furnace's and heat pumps. When your HVAC system breaks down, we can replace any damaged components and get you up and running in no time. 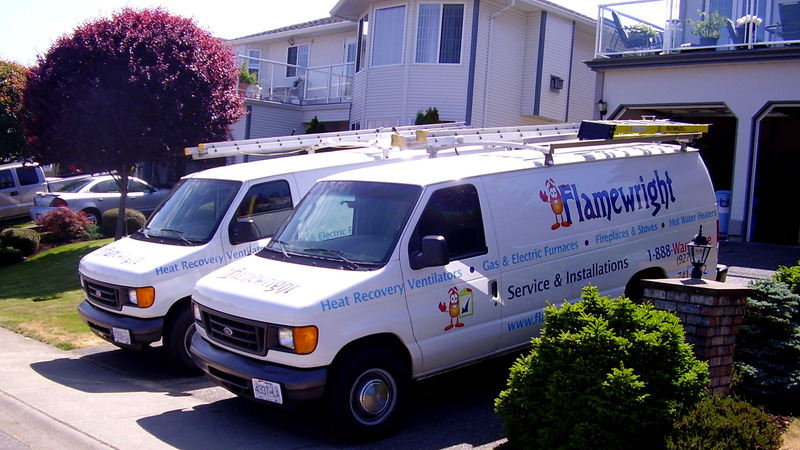 If you are having problems with your heating system anywhere in Nanaimo, call Flame Wright right away! There’s no reason to suffer when you have Nanaimo’s most reliable HVAC repair service at your fingertips.